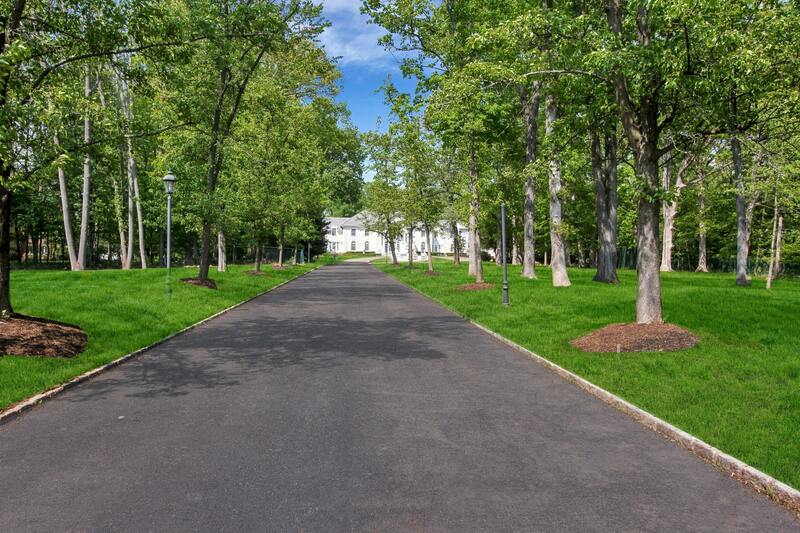 Astoundingly luxurious, exquisitely detailed private residence in ultra-desirable and prestigious Livingston NJ, set on 7.79 breathtaking lush secluded acres. A very rare opportunity to reside in one of the grandest and gracious estate homes in the Northeast. This magnificent estate, boasting 9 bedrooms and 10 full baths, is accessed by a gated entrance and a long half-mile drive that winds through lush landscaping. A truly one-of-a-kind, European-inspired architectural masterpiece, indescribably grand and offering 20,000 square feet of opulent upscale living space with every superlative amenity expected from a property of this uniqueness and extravagant style. 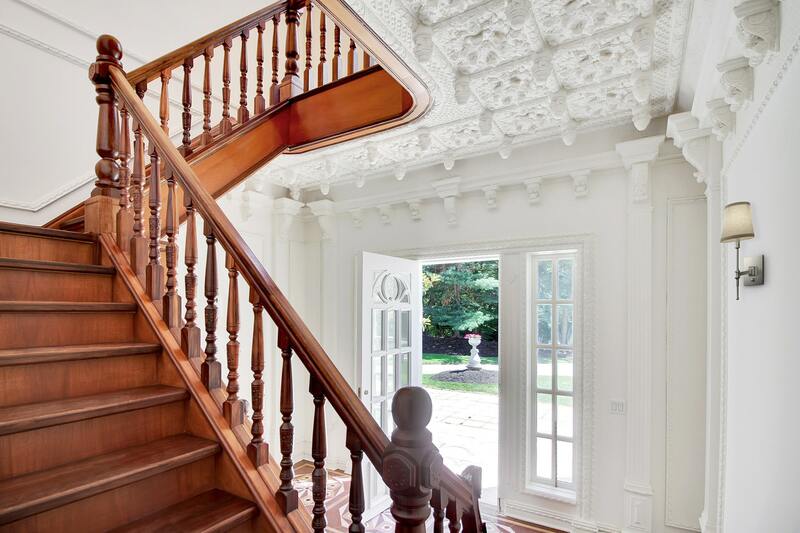 A spectacular foyer with a sweeping double staircase greets your entry and showcases the incredibly sophisticated detailing, woodwork and finishes that set this unrivaled home apart from all others. Enviable sophistication is yours to enjoy with soaring 25-foot hand-molded ceilings, handcrafted 2-inch mahogany floors with hand-carved details throughout, refined marble, onyx and 24-carat gold accents in sumptuous baths, and an elevator that transports you between floors. The awe-inspiring living room with 2-story ceilings, balcony, triple fireplaces and elegant columns is a stunning backdrop for entertaining. 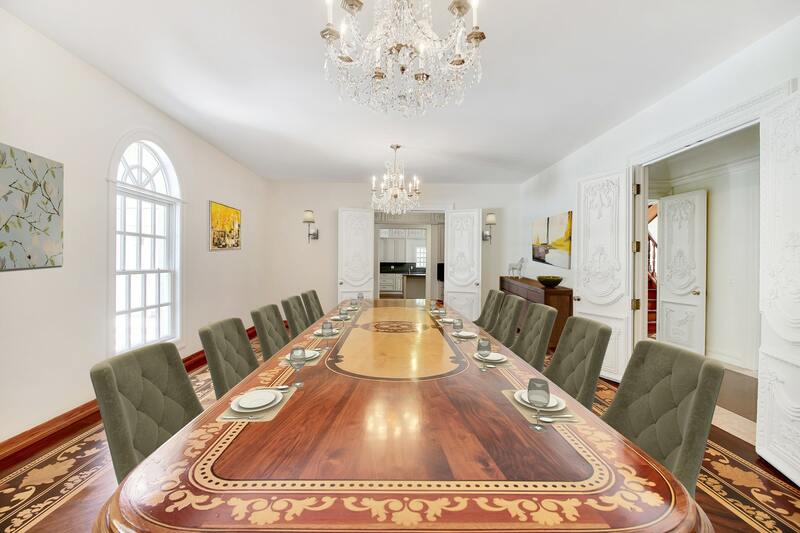 The regal formal dining room accommodates lavish dinner parties of up to 24 guests gathered around the supremely-designed handcrafted wood table. The exquisitely appointed new gourmet kitchen will please even the most discerning of chefs while the master suite is the piece-de-resistance, comprising a second-floor wing of the residence with custom study, two generous walk-in closets, large fireside bedroom and a spectacular new marble master bath. An unparalleled caliber of luxury is also afforded via a lush, resort-like rear property with heated swimming pool and tennis courts. 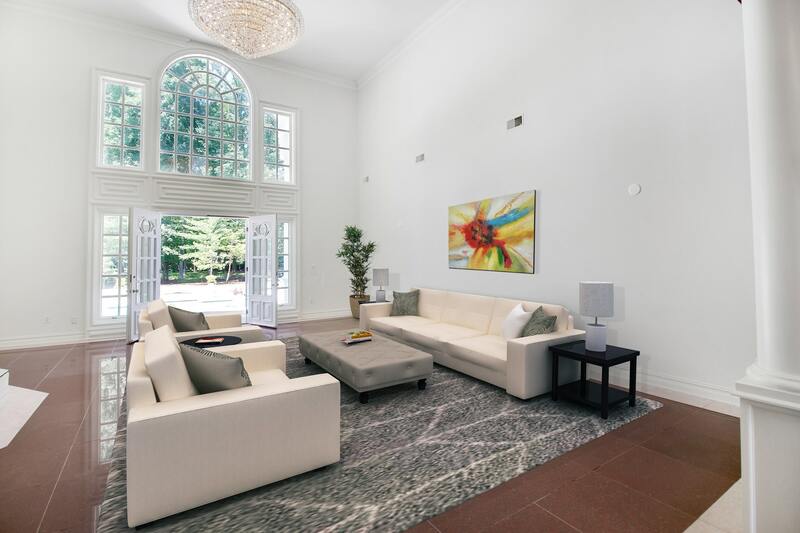 One of the most coveted fashionable living destinations in the New York metropolitan area, Livingston NJ is easily accessed by private jet service just 5 miles away, as well as all three major NJ/NY international airports. Further, it boasts upscale and exclusive shopping at both the Livingston Mall and The Mall at Short Hills. The neighborhood is incredibly exclusive, very proximate to Manhattan (17 mi) and known for its highly-ranked school system. Named for William Livingston, the first post-colonial governor of New Jersey, the township was supported by the lumber, dairy and shoe industries until after World War II when the population exploded. Today, Livingston is home to multimillion-dollar mansions along with a wealth of services and conveniences, 600 acres of parkland and top-tier medical service providers including the Summit Medical Group and the St. Barnabas Medical Center, perennially ranked as one of the top hospitals in the nation. Originally built in 1988, the home’s present owners have embarked on a two-year transformation of the estate that has become an architectural tour de force…comprised of an elaborate convergence of unsurpassed detailing, lavish styling and European influences. Outside, the property sits privately on nearly 8 lush acres in prestigious Livingston, with wonderful sunset views captured on clear evenings. The mansion awaits visitors at the end of a long drive and a circular parking court, creating a commanding presence and promising no less, elegantly framed by sprawling lush lawns embellished with a Grecian-style fountain, tennis courts and heated in-ground pool with spa. An oversized three-car garage is de rigueur for the automobile aficionado. Inside, no detail has been spared in its intricate craftsmanship, where fresh white walls and delicate friezes, some beautifully adorned with gold leaf, are set above hand-carved moldings and trims, and where inlaid marble and mohagony floor designs, fluted Corinthian-style pillars, onyx and 24-karat bath fixtures and sinks, and custom plaster ceilings serve as the backdrop for this grand home’s 20 rooms. There are no fewer than 5 fireplaces, 9 bedrooms, a stunning chef’s kitchen, an elevator to three floors, a grand reception hall that harkens back to the days of Versailles, and so much more. Splendor is the hallmark of an impressive two-story reception hall that showcases a grand butterfly staircase with ornate French detailing designed to impress the most discerning of dignitaries. Anchored on custom marble floors and set beneath a 25-foot high ceiling with custom detailing, the formal fireside great room graciously welcomes guests while French doors usher them out to a covered palazzo and lush grounds for the ultimate sunset cocktail hour. 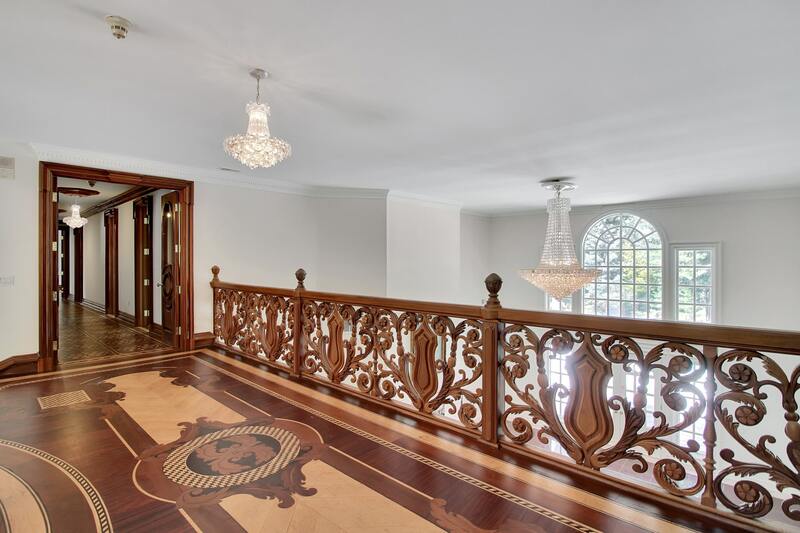 Across the foyer is an ultra-chic sitting room with masterful trim and walls of windows. 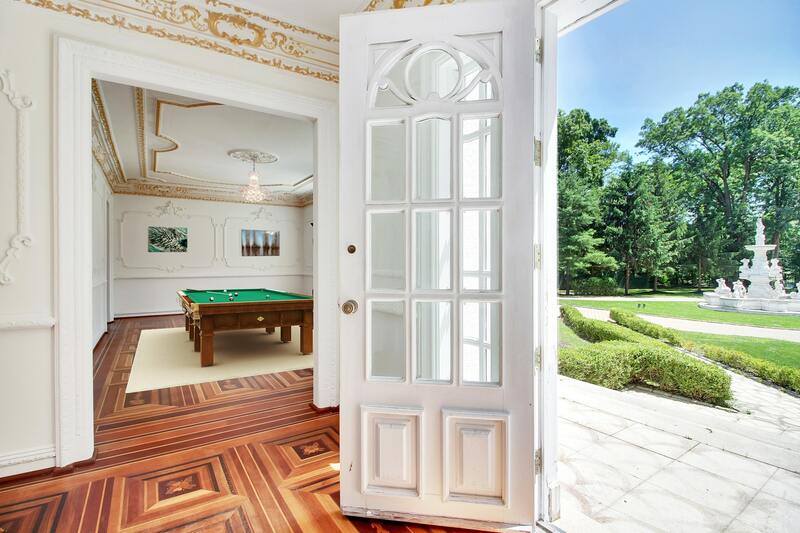 A billiard room with nearby built-in wet bar, adorned in gold leaf friezes, custom wall and ceiling moldings, stunning mahogany floor design and French doors leading to the front parking court, offers idyllic views of the front Grecian fountain, creating a paradise for the senses. A banquet-scale formal dining room with custom built-in handcrafted table that comfortably seats 24 sets the tone for a lavish experience under two dramatic chandeliers, set on a custom patterned inlaid banded floor that adds distinction as do views of the spectacular rear property. Upscale leisure living takes place in the beautifully appointed fireside media/family room…the perfect respite for casual gatherings. 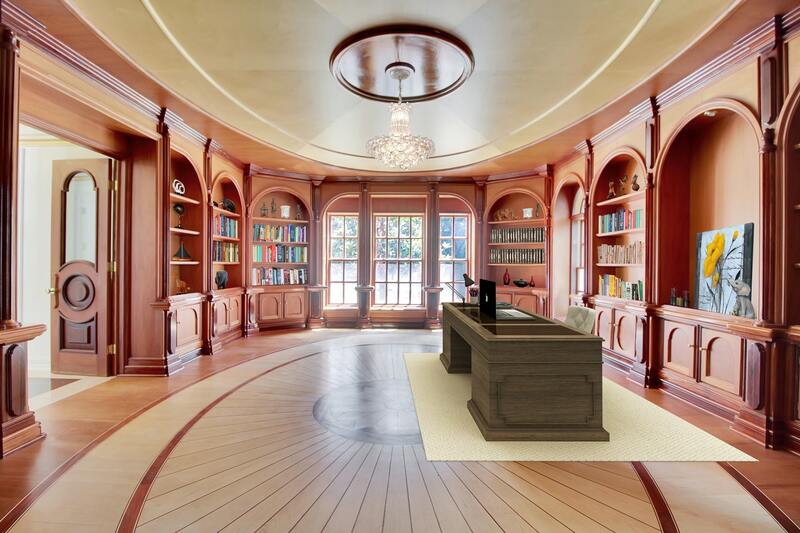 The residence would not be complete without a 12-foot high welcoming library, privately set at the end of a long hall clad in mahogany from floor to dramatic ceiling with built-in bookcases and bathed in the warmth of a focal fireplace. 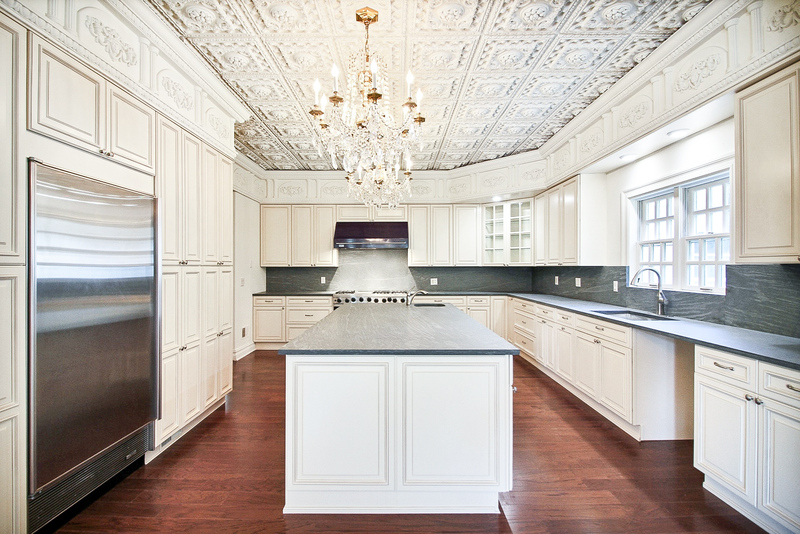 The formal kitchen is bright, open and airy and privately reserved for the homeowner. 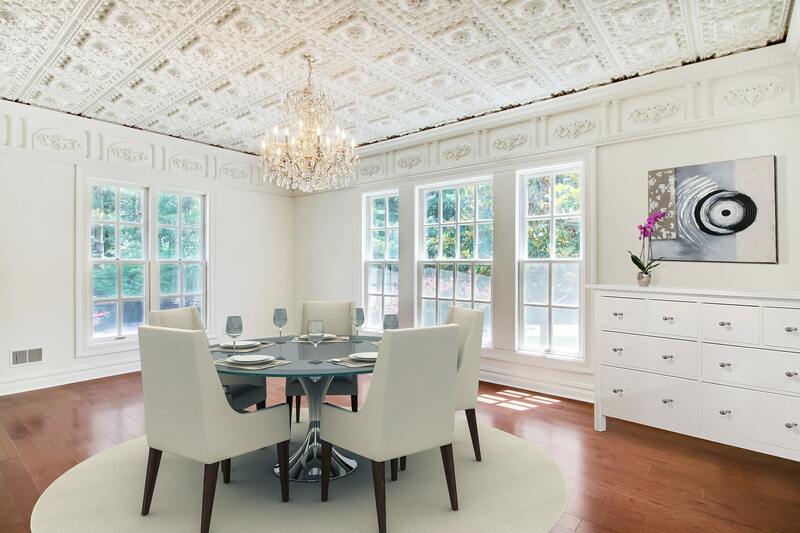 Conveniently located off the family room, this is the discreet heartbeat of the home, featuring hardwood floors, walls of windows and ornate wall and ceiling decoration. 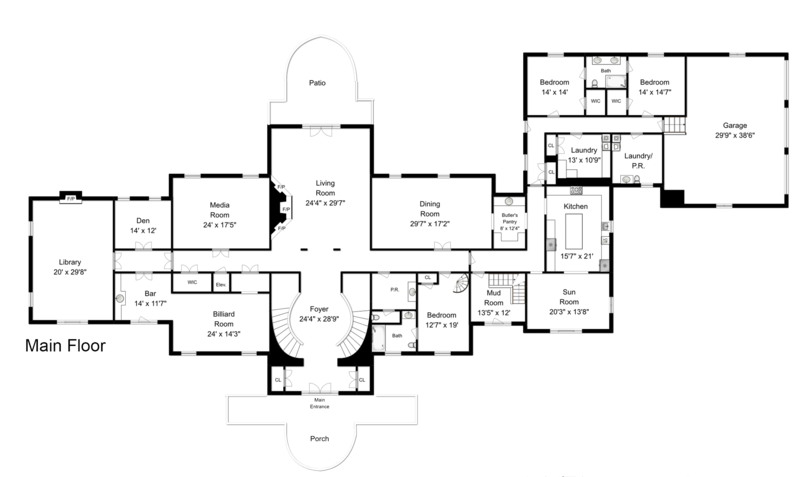 The butler’s pantry, located across a hall from the kitchen and adjoining the dining room, is grand in scale and a designer showcase. Nearby, a sun-drenched formal breakfast room off the kitchen has high decorative ceilings and walls of windows that take in breathtaking views of the expansive grounds– the perfect venue in which to serve the fortunate overnight guest with a morning meal. A sitting room or first-floor bedroom adorned with a gold-leaf ceiling is no less formal and eminently fit for royalty, while an exquisite full bath adjoins the sitting room, creating a sumptuous first-floor guest wing if desired. Buyer’s choice! A 24-karat gold faucet, intricate moldings, and a custom marble floor adorn the first-floor powder room. A long hall with two maid's rooms with shared bath, laundry facilities and a multi-purpose room, wrapped in tile from floor to ceiling with convenient center drain, connects the main house to a three-car oversized garage. 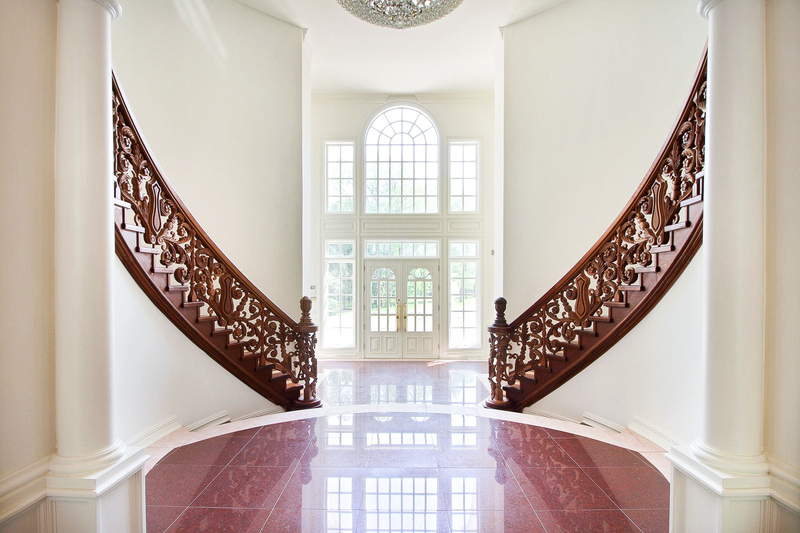 The grand staircase leads to an open second-floor gallery that overlooks the reception hall below.The piece de resistance of the home is the private master quarters that occupy the entire west wing of the home. 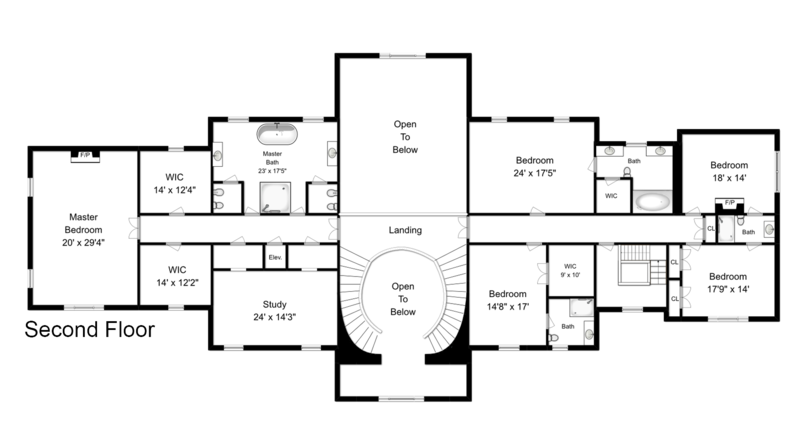 The master bedroom, set at the end of a long hall with a study, master bath and two generous walk-in closets along the way, enjoys panoramic front and side views from large windows and a vaulted ceiling that adds height to the already expansive 30' x 20' room. 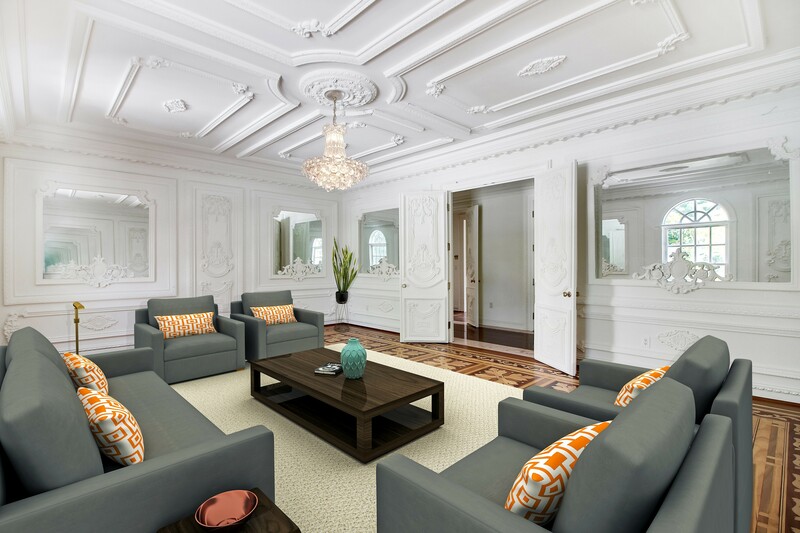 A coffered master study is a welcome retreat with custom wainscoting and a floor design featuring an American bald eagle. 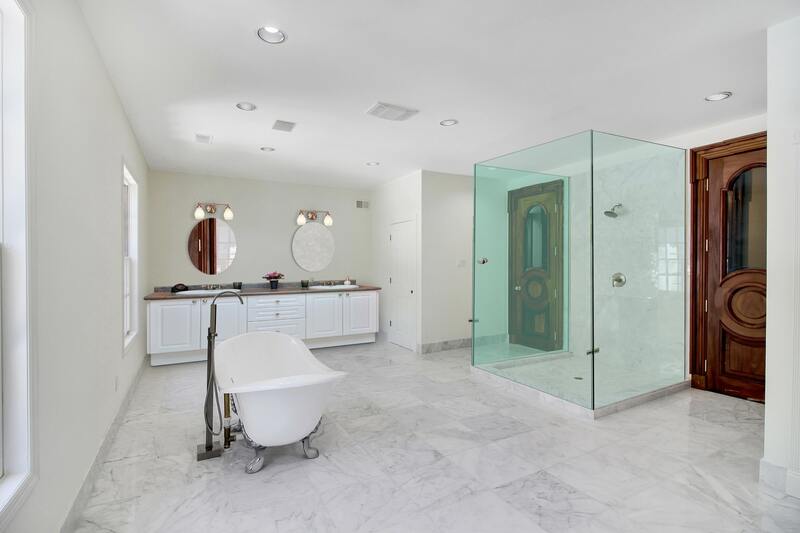 The luxurious and spacious master bath is modern in design, featuring two spacious vanities, separate commode, soaking tub and delightful walk-in shower with 3 glass walls. A very fortunate buyer will experience the lavish lifestyle that only the rear property of this residence offers, with expansive terraces and patios, Olympic sized swimming pool with adjoining spa, tennis courts and nearly 8 acres of room to play. Entertaining will be effortless for small intimate gatherings or large social events. Beyond the extraordinary…with its elaborate European styling, its meticulous attention to detail, exquisite location and grounds, this impressive estate is a rare New Jersey treasure. 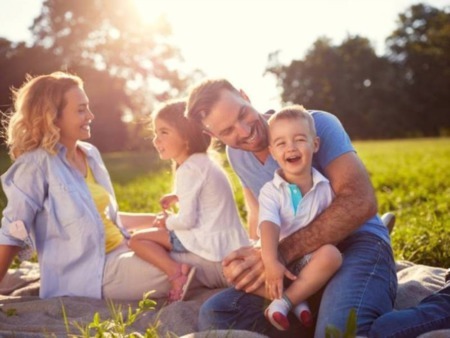 Well known for his success in the Livingston real estate market, Anthony Verducci has successfully represented the highest sales prices in Livingston for three of the past four years. 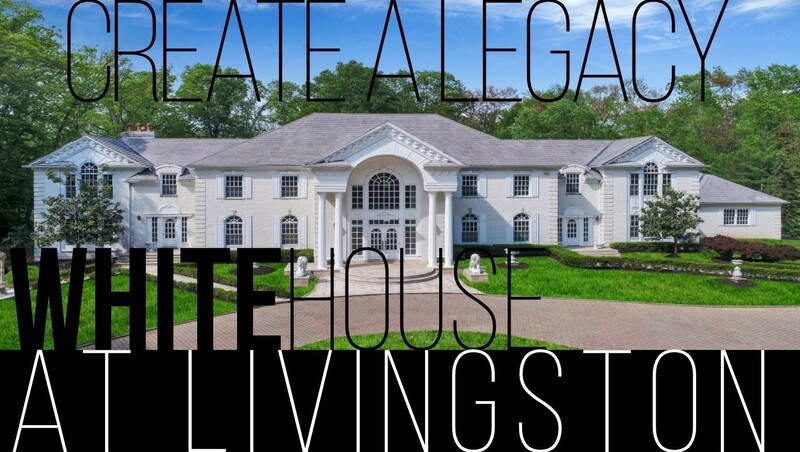 Closing for $6.2M in late 2015, the sale of the prestigious Kean Estate continues to represent the highest sales price ever in Livingston and was the highest sales price in all of Essex County for 2015. Enter 2018. Anthony is now introducing his most extraordinary and exclusive Livingston listing to the market, an astoundingly luxurious, exquisitely detailed private residence set on 7.79 breathtaking lush secluded acres. The most expensive rental ever introduced to the local market, it has the potential to quickly become a nearly $100M real estate redevelopment project.